1 bedroom suites from $1,000 per month. 640 sq ft or up. Building Amenities: On-site laundry, secured entry with Intercom and outdoor parking. Neighborhood: Pinetree rental apartment building is only 9 minute drive to both Highstreet Shopping Center and Seven Oaks Malls. Ten Broeck Elementary School is just across the street, 5 minute drive to parks/playgrounds. 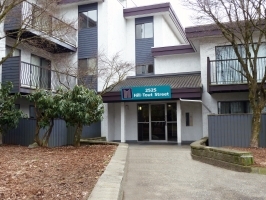 Near major bus stops, 10 minute drive to Abbotsford Memorial Hospital (4.8 km).